In the last month or two, ISO, the International Standards Organization has introduced an important new standard covering assessments in the workplace, ISO 10667. ISO 10667’s full title is “Assessment service delivery — Procedures and methods to assess people in work and organizational settings”. It’s a wide-ranging standard that covers all kinds of assessments in the workplace from appraisals and coaching through psychological tests, it includes knowledge and skill quizzes, tests and exams in recruitment, training and compliance. 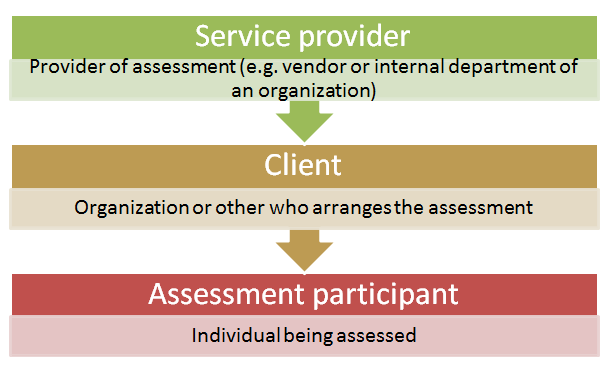 There are three key roles defined in the standard: Service provider, Client and Assessment participant as shown in the diagram below. Assessment in the workplace lets you see into the minds and hearts of employees and other stakeholders, but also potentially discloses sensitive and private data that requires privacy. The standard covers issues such as informed consent and what to do to ensure proper treatment of assessment data; it will help you ensure you are following best practice. If you make decisions on employees (e.g. hire, fire, promote) as a result of assessments, then following the standard could be helpful if any such decisions are disputed (by trade unions, courts of law or individual employees). When people cheat at assessments, they often rationalize the cheating to themselves that it’s fair to do so because the assessment programme is unfair. Publicly committing to a standard like ISO 10667 can help you promote your assessment programme as open, fair and reasonable and so make it less likely that people will rationalize cheating on it. The standard has been written by experts in assessment, following it lets you learn and follow best practice. To help people considering using Questionmark to comply with ISO 10667, we have produced a short white paper on the standard and how Questionmark can help you meet it. The white paper is free with registration and is available here.